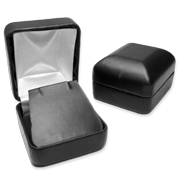 Discover beautiful black leatherette boxes for your precious collections! This elegant line includes the perfect items for packaging rings, earrings, necklaces or pendants. Transform the way you showcase your pieces and take advantage of our special wholesale prices that won't break the bank!